Winston Moss was part of an amazing era in Hurricanes football history, and didn’t have to travel far to get here. 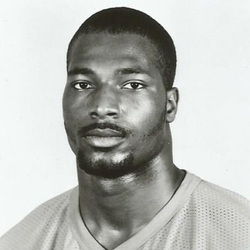 Moss joined the Hurricanes from Miami's Southridge High School, where he was coached by UMSHoF member Don Soldinger. He was named All State in leading the Spartans to the state football finals and he was also a standout in track, winning the state shot put title his senior year. Winston was one of only a few first-year players to contribute during Miami's miraculous climb to the 1983 National Championship, still one of the most treasured times in his life. Lining up at defensive end, his best outing was a five solo tackle performance against FSU that helped get Miami to the Orange Bowl game and the school's first title. In 1984, he alternated positions at linebacker and defensive end. In his junior year, he started every game at strong side linebacker and finished the season with 75 tackles (third highest on the team). Winston seemed to relish lining up against the Gators, as he had 12 tackles as a junior and 17 tackles (9 solo) and a sack as a senior. His final year in 1986, he lined up with some of the finest talent Miami has ever seen. Teaming with UMSHoF members Bennie Blades, George Mira, Jr., Jerome Brown and Dan Stubbs among others, the Miami defense was a force to be reckoned with. While others strutted their stuff on the field, Winston quietly went about his business, finishing with 87 total tackles (60 solo) though only playing in 9 contests. He was named MVP of Miami's Homecoming win over Tulsa with 9 tackles (8 solo). He was truly the heart and soul of the Canes defense. Winston says he is most proud of the legacy created by the young men who challenged each other to give their best! A second round pick of the Tampa Bay Buccaneers in the 1987 NFL draft, Moss would play 11 seasons in the league for the Bucs (1987-1990), the Los Angeles Raiders (1991-1994), and the Seattle Seahawks (1995-1997). He and his wife, Zoila, have five children-Winston, Jr., Victoria, Robert, Marcus and Isabella.